I love pasta and i love seafood. It was one of those days where i just spent thinking about food. What i wanted to try, what to make for dinner. I happen to turn on the TV to food network and Everyday Italian has just started. Giada had a delicious menu that had my mouth watering the entire time. I just couldn't wait to try these new dishes out. So here's the 1st out of the 3. 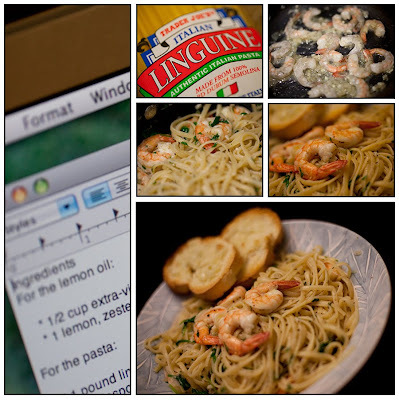 Linguine with Shrimp and Lemon oil. For those of you you like the citrus flavor in your pasta, this is it. Every ingredient in this dish just compliments each other so well. The freshness of the lemon with the peppery flavor of the arugula just gives it am amazing flavor. We made come garlic bread on the side and it was just YUM! It's super easy and quick. Just what everyone needs in today's busy lifestyle. Here's the recipe :). Meanwhile, in a large, heavy skillet warm the olive oil over medium heat. Add the shallots and garlic and cook for 2 minutes. Add the shrimp and cook until pink, about 5 minutes. Add the cooked linguine, lemon juice, lemon zest, salt, and pepper. Toss to combine. Turn off the heat and add the arugula. Using a mesh sieve, strain the lemon zest out of the reserved lemon olive oil and add the oil to the pasta. The zest can be discarded. Add the chopped parsley to the pasta and toss to combine. Serve immediately.